Here is a quick excel number formatting tip. If you ever want to format numbers in such a way that it shows decimal values only if the number is less than 1 you can use conditional custom cell formatting (do not confuse with conditional formatting). In such cases you can use conditions in custom cell formatting. Now, write the formatting condition for custom formatting the cell. In our case the condition looks like [<1]_($#,##0.00_);_($#,##0_). See to the right. what it means is, if the cell value is less than 1 then format the cell in $#,##0.00 format otherwise format as $#,##0. Excel cell formatting is a tricky business and if you want to master it there is no better source than Peltier's article on Custom Number Formats. and right align the cells (or choose the General alignment), the ones place will be lined up vertically, and the numbers will be easier to read. Is there a problem with displayed precision mismatch with this format? 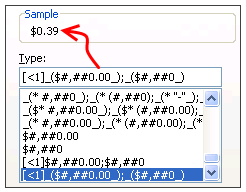 A value of 0.99 shows two decimal places, while 1.01 shows none. Perhaps changing the beginning to [<10] would be more appropriate. @Jon, thanks for that tip. It sure helps to have the numbers aligned properly despite showing no decimals. I guess somebody upstream of you truncated them with a clever number format. What if I want to apply this for percents where anything below 100% has a decimal? I tried [<100]##.0%;###% and the results were 100.% or 96.5% so it's half right! What am I missing? how can I display 0.193 as ¢19.3 on a report. What format do I put in the Custom opton to get 1.2 when I type 12. Is it possible?